Custom pickers for Unity game engine editor. Replacement for default object selection window that shows folders structure and enables filtering by asset path. Replacement for default enum selection popup. Allows filtering by value names. Type selection button for your custom editors. Smart search using multiple strings (space seperated, order matters). All pickers provide API to use in your editors. Asset Picker is faster than builtin. Copy Assets/UnityPickers and Assets/Editor/UnityPickers to your Unity project. Asset Picker will be instantly enabled for ScriptableObject fields in user-defined types. You can mark specific field with [AssetPicker] attribute to enable Asset Picker for it. Enum Picker will be instantly enabled for all user-definded enum fields. Open bundled project in Unity (I was using 2017.1.1p4). Open START_HERE asset in inspector and hit object selection buttons near fields to open Asset Picker. Click on enum value of Monster Type field to show Enum Picker. STAR_HERE type is defined in StartHereAsset.cs. Threre are some field attributes. Select Tools/Asset Picker menu or hit Ctrl+Alt+Shift+O to open Asset Picker in browsing mode. Drag-and-dropping into object fields from Project View becomes less convenient as project grows. Searching for specific object is tiresome. Default object selection window doesn’t show folder structure and doesn’t allow to filter by folder names. It is crucial to make full use of folders structure when you have many files. Default object selection window becomes incredibly slow on large projects. Default enum selection popup lacks filtering by value names. 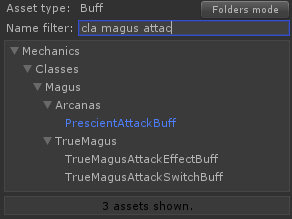 Our component system and visual scripting tools need control for type selection (similar to ‘Add Component’ for Game Objects).